Edible Audience is an interactive augmented reality performance. 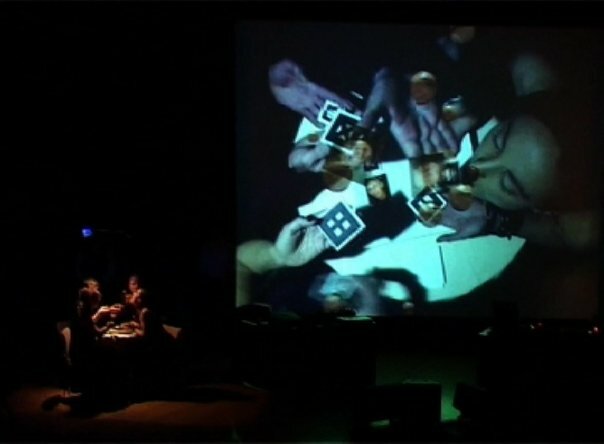 Four performers virtually ate images of the audience on stage at the National Gallery of Australia. This interactive sound art interface was programmed by Tim Barrass, and is performed by Stephen Barrass, Anita Fitton and Caitilin de Berigny from the University of Canberra, and Alistair Riddell from the Australian National University. The Augmented Reality System (AVIARY) used to track the food was developed in collaboration with Peter Morse from the University of Melbourne. 2005 | Edible Audience, Liquid Architecture 6, Australian National Gallery, Australia.